I wish each and every member of our family a Happy New Year. Our team has made tremendous progress during these last six years and we are now seeing our first wave of doctoral graduates who began their graduate careers as part of the TANMS family. During this six year period, we have also worked with many excellent middle/high school, undergraduate, master, and postdoctoral talents through our education programs. Many of our former students are now with some of the most prestigious industries, labs and academic programs, and represent the best professionals that this country has to offer. We are extremely proud of their accomplishments and look forward to their achievements in changing the world in the years to come. During this last year, TANMS achieved some major milestones as well as initiated new directions. Our modeling team has successfully combined a wide range of world-class software programs tackling the most complex problems facing our multiferroic community. These codes allowed substantial progress on the memory testbed with accomplishments poised to provide a new avenue for commercially available magnetic memory structures. In addition, TANMS also successfully demonstrated the first electrically small multiferroic antenna element and recently recorded the transfer of data on another electrically small antenna. These promising antenna advancements are leading the community toward a new paradigm for future antenna systems based around TANMS discoveries. Finally, TANMS has begun to pursue cell manipulation using the original concepts proposed for the motor testbed. This new area offers exciting new approaches in addressing several important health issues facing our society. As we approach our sixth year renewal, I want to thank each and every one of you for helping TANMS succeed. Our Industrial Advisory Board (IAB) has played a key role in directing our research focus as well as the development of our students. The partnership we have with each of our IAB members provide invaluable guidance and unique experiences for our students and faculty as we transition our technology. TANMS has engaged the best and brightest that our community has to offer and all of you will continue to make significant impacts on our world. As we bid farewell to 2017 and welcome a new and exciting 2018, thank you and I wish everyone a great year! With support from both the National Science Foundation and U.S. Army Research Office, researchers from government, industry, and academia will meet on topics surrounding "Controlling Magnetism and Functional Phonons on the Small Scale". This is the third annual event hosted by TANMS that has led to increasing support and interest in the field of multiferroic, RF technologies. For more details and registration information, go to http://arsm.tanms-erc.org. With orchestration by TANMS' new Director of Industry Relations, Schaffer Grimm, TANMS welcomes industry representatives to UCLA in an one-day event to meet and interact with TANMS research teams and TANMS Industrial Advisory Board members to learn about breakthrough potentials of cutting-edge nanoscale multiferroic research and technology. For more details and registration information, go to http://www.tanms-erc.org/news. It is hard to imagine that TANMS is half way through our sixth year and is up for a critical renewal review this year. Mark your calendars! Details pertaining to the exciting event will be released in the coming months. TANMS is honored to have been enlisted as the organizers for a special National Science Foundation event. Leaders from current ERCs, NSF and international agencies will meet to explore the potentials of expanding the current NSF ERC C2C program to additional countries. This is an invitation only event. Faculty with interest to participate or provide recommendations on potential foreign collaboration should speak with their respective center directors. Breakthrough in TANMS antenna research led by Professor Nian Sun's team at Northeastern University has drawn international attention in the science community. The publication in Nature Communications titled "Acoustically actuated ultra-compact NEMS magnetoelectric antennas" confirms the potentials of mini-antennas in applications of medical technologies such as tiny brain implants, micro-medical or wearable devices. State-of-the-art compact antennas rely on electromagnetic wave resonance, which leads to antenna sizes that are comparable to the electromagnetic wavelength. As a result, antennas typically have a size greater than one-tenth of the wavelength, and further miniaturization of antennas has been an open challenge for decades. Here we report on acoustically actuated nanomechanical magnetoelectric (ME) antennas with a suspended ferromagnetic/piezoelectric thin-film heterostructure. These ME antennas receive and transmit electromagnetic waves through the ME effect at their acoustic resonance frequencies. The bulk acoustic waves in ME antennas stimulate magnetization oscillations of the ferromagnetic thin film, which results in the radiation of electromagnetic waves. Vice versa, these antennas sense the magnetic fields of electromagnetic waves, giving a piezoelectric voltage output. The ME antennas (with sizes as small as one-thousandth of a wavelength) demonstrates 1–2 orders of magnitude miniaturization over state-of-the-art compact antennas without performance degradation. These ME antennas have potential implications for portable wireless communication systems. Presently, the form factor of current telecommunication devices is fundamentally limited by the wavelength that the antenna is designed to transmit or receive. To subvert this paradigm, TANMS has developed strain-coupled multiferroic systems relying on optimized magnetostrictive materials, such as nanoscale multilayers of galfenol (FeGa) and permalloy (NiFe). These FeGa/NiFe multilayer composites combine the magnetic softness and low loss of NiFe with the high magnetostriction and magnetization of FeGa, at the same time allowing for the tuning of these properties via individual layer thickness. A structure optimized with respect to its magnetic softness, magnetoelasticity, and loss at microwave frequencies boasts an 88% reduction in coercivity and a 55% reduction in ferromagnetic resonance (FMR) linewidth at X-band compared to a single phase FeGa film, all while maintaining a high relative permeability of 700 and a saturation magnetostriction up to 70% that of single-phase FeGa. The depth-dependent composition and magnetization of these heterostructures were assessed as a function of electric and magnetic fields via polarized neutron reflectometry, revealing that the rotation of magnetization of the individual layers with applied strain was deterministic. Device functionality was assessed by integrating multilayer samples into two different antenna architectures. FeGa/NiFe multilayers incorporated into a surface acoustic wave antenna were shown to absorb a significant percentage of acoustic wave energy from a vibrating LiNbO3 substrate, and a bulk acoustic wave antenna was used to demonstrate efficient conversion of an electromagnetic wave into mechanical vibrations. The magnetic softness, low loss, and high strain sensitivity of these samples make them ideal candidates for integration into strain-coupled multiferroic systems, including the next-generation antenna concept being developed by TANMS. This school year, 1000 high school and middle school students will experience TANMS new Electromagnetism and Nanoscale Motors Module at seven schools in three districts local to UCLA (Centinela Valley Union High School District (CVUHSD), Inglewood and LAUSD). The TANMS module was developed by TANMS Professor Jane Chang and four engineering doctoral students at UCLA working in collaboration with Lawndale High School Physics teacher, Lyn Genota, and piloted in her classroom in May 2016. Mrs. Genota is a veteran Physics teacher and an adviser to the Mathematics Engineering Science Achievement (MESA) team at her school. Following the Lawndale pilot experience, TANMS held the first TANMS Summer Teacher Institute (June 22-24, 2017) with participants from seven schools agreeing to implement the EM Nanoscale Motors Module in their classroom. Each teacher received from TANMS hands-on classroom activity kits and will be collecting data from students on their science learning, confidence, and interest in doing science and engineering career aspirations. The TANMS Electromagnetism and Nanoscale Motor Modules were developed to align with the Next Generation Science Standards (NGSS) while incorporating fundamental concepts from core TANMS research involving multiferroics and nanoscale motors. Over two class periods, students engage in interactive lectures and hands-on activities as they investigate the world of electromagnetism and explore multiferroic science and nanomotors. TANMS hosted 12 undergraduate students during our 2017 REU program at three center campuses (CSUN, UC Berkeley and UCLA). The diverse group of undergraduates came from two community colleges four universities in California, and three out of state institutions (Praire View A&M, The University of Texas Austin and University of Arizona). During the 8-week program, students carried out research projects in one of five TANMS labs (Kiossis, Ramesh, Sepulveda, Carman, and Tolbert). In addition to their lab-based research projects undergrads engaged in a variety of skill-building activities and a field trip to Los Angeles Exposition Park to visit the California African American, California Discovery Science Center, and Natural History Museum. During the field trip and in other jointly organized, activities REU undergrads were also able to interact with our YSP high school participants serving as mentors and sharing their college experiences with them. Two REU students share their perception of how their REU experiences has impacted their sense of engineering confidence and career aspirations. “TANMS opened my eyes to opportunities that are available to me and made the idea of going to grad school and being a professor seem reasonable. Before I didn’t know if I could do that, but this experience proved to me that I can." TANMS is proud to commend Zhi (Jackie) Yao, for winning the Best Student Paper Competition at the 2017 IEEE International Microwave Symposium in Hawaii. 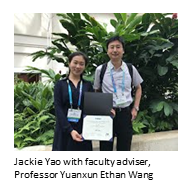 Jackie was a doctoral student under Professor Ethan Wang in the UCLA Department of Electrical Engineering and successfully completed her defense this past summer. Her research focuses on the development of 3D multiferroic antenna modeling capability that incorporates full interactions between elastodunamics, micromagnetics and electromagnetics. The TANMS 3D antenna modeling is a rigorous yet computationally efficient, and capable of modeling the complex magnetoelastic anisotropies, dispersive, and/or nonlinear behavior accurately. The numerical modeling tool provides guidelines and theoretical support to the multiferroic antenna design which is progressing along well within the center. Jackie is one of the center's brightest talents who was a former recipient of the Qualcomm Innovation Fellowship. TANMS is proud to announce Jackie Yao as one of our newest graduates and is grateful to have her remain on our research team as a postdoctoral researcher. The NSF ERC Program hosts a Perfect Pitch Competition to provide students with the opportunity to learn a succinct way of talking about their research in the context of societal needs and the broader impact of their success. After winning the TANMS ERC Perfect Pitch Competition in September, Stephen Sasaki, TANMS doctoral student from UCLA Chemistry and Biochemistry department represented TANMS at the 2017 National NSF ERC Perfect Pitch Competition and won second place with his pitch titled "Wireless Lab on a Microchip: A Continuous Clinical Grade Health Monitoring Implant". Stephen is the current TANMS SLC President and participates on the Materials Thrust under the guidance of faculty adviser Professor Sarah Tolbert. As TANMS research explores applications of multiferroic discoveries in the medical field, the 3D Thrust welcomes the addition of Professor Dino Di Carlo and graduate students, Reem Khojah and Yilian Wang. Professor Di Carlo is a Professor in the department of Bioengineering and Biomedical Engineering interdepartmental graduate program at the University of California, Los Angeles. He received his B.S. in Bioengineering from the University of California, Berkeley in 2002 and received a Ph.D. in Bioengineering from the University of California, Berkeley and San Francisco in 2006. He then conducted postdoctoral studies from 2006-2008 at the Center for Engineering in Medicine at Harvard Medical School and Massachusetts General Hospital. Among other honors he was awarded the Presidential Early Career Award for Scientists and Engineers, the National Science Foundation (NSF) Faculty Early Career Development award, the U.S. Office of Naval Research (ONR) Young Investigator Award, the Packard Fellowship for Science and Engineering and Defense Advanced Research Projects Agency (DARPA) Young Faculty Award, the National Institutes of Health (NIH) Director’s New Innovator Award and Coulter Translational Research Award. With his expertise in the area of cell sorting and microfluidics, Professor Di Carlo joins the TANMS 3D Thrust to investigate applications of multiferroics in life sciences, particularly in magnetic-based cell sorting. Each issue of the TANMS Multiferroic Focus will profile a few of our Industrial Affiliates Partners. 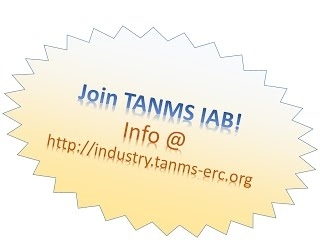 TANMS industry partners play a crucial role realizing the TANMS vision in translating nanoscale multiferroics research discoveries to societal needs. Our sincere gratitude for the support from all of our members and look forward to cultivating a successful partnership. TANMS is excited to welcome BAE Systems Inc. as a Premium Member to our Industrial Advisory Board. BAE Systems, Inc. is the U.S. subsidiary of BAE Systems plc, an international defense, aerospace and security company which delivers a full range of products and services for air, land and naval forces, as well as advanced electronics, security, information technology solutions and customer support services. Western Digital Corporation, together with its subsidiaries, develops, manufactures, and sells data storage devices and solutions worldwide. It offers performance hard disk drives (HDDs) that are used in enterprise servers, data analysis, and other enterprise applications; capacity HDDs and drive configurations for use in data storage systems and tiered storage models, as well as for use in storage of data for years; and enterprise solid state drives (SSDs), including NAND-flash SSDs and software solutions that are designed to enhance the performance in various enterprise workload environments. NextGen Aeronautics develops technologies to advance the frontiers of flight. From its roots in aerospace structures, NextGen has expanded its expertise to R&D, design, fabrication and testing in a wide range of disciplines, including multi-functional materials and structures, sensing and control systems, and integrated antennas. NextGen has an outstanding team of engineers, scientists, and technicians working on an ever-changing set of exciting and challenging projects, in close collaboration with customers and partners.